Two deals announced last week point to a resurgence in reinsurance M&A following a drop in valuation multiples and as firms seek diversification and scale in a tough market, Fitch Ratings says. “Reinsurance M&A stalled this year after a spike in valuations, with several transactions pricing at around 2x book value and probably putting off other potential buyers,” Fitch said. “But Japanese non-life firm Sompo Holding’s USD6.3bn agreement to buy Bermuda’s Endurance Specialty Holdings represents a 1.4x multiple. “Similarly, Chinese state-owned companies Shenzhen Qianhai Financial Holdings and Shenzhen Investment Holdings’ USD1bn acquisition of Singapore’s Asia Capital Reinsurance is at a 1.3x multiple. “These multiples are well within the historical range of 1.1x to 1.8x, suggesting valuations are adjusting to reflect the combination of worsening investment returns and overcapacity, which together are likely to reduce profits in 2017. “Both deals announced last week are primarily driven by buyers looking to diversify and grow outside their home countries and core markets. Asian buyers have been particularly active in this regard, led by Japanese firms, which face weak domestic investment returns due to negative Japanese interest rates. “Expansion into the relatively profitable US and London markets is intended to provide avenues of growth while boosting the bottom line. “Significant surplus capacity in the market will also drive M&A in 2017 by making organic growth harder to achieve and leaving acquisitions as the main source of growth for larger firms with still-healthy balance sheets. 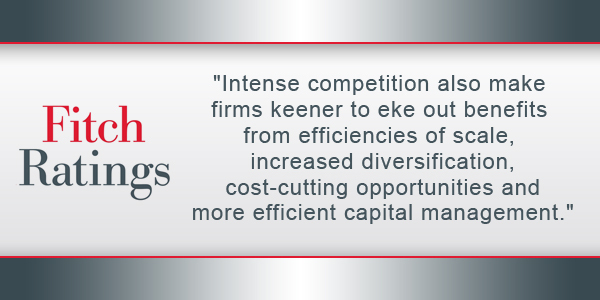 Intense competition also make firms keener to eke out benefits from efficiencies of scale, increased diversification, cost-cutting opportunities and more efficient capital management. “The reinsurers hit hardest by market weakness will likely be smaller, less diversified firms operating in markets where premiums have fallen to the point where they no longer cover the cost of capital. These firms may become acquisition targets as stresses leave them more likely to accept lower valuations.